Daniel House chronicled the events that took place during move-in day and compiled all the quotes form today's press conferences. Check out his first training camp notebook, following the jump. 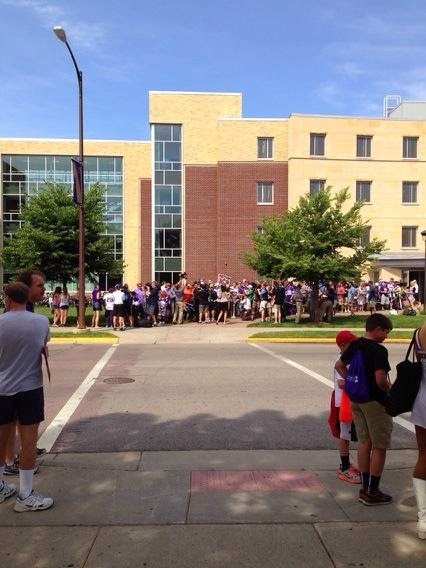 The Vikings arrived to Mankato, MN for the city's 49th training camp between 10 a.m. and 2 p.m today. Fans flurried the sidewalks of MSU-Mankato as early as 8 a.m. this morning, in hopes they could secure an autograph from some of their favorite Vikings players. Players began to arrive around 11:00 a.m. and carried their belongings into the Julia Sears dorms of the college campus. We learned some interesting information today during some of the first interviews we have heard from players and coaches since the five-week absence. I have penned some of the observations and notes from the events that took place as the Vikings made the move into the dorms for training camp. As the Vikings made the walk from the parking lot to the Julia Sears dorms, you could see the transformation players have made with their bodies. In June, I inked a post talking about the new Vikings free weight program, which was implemented with thought of re-tooling bodies and becoming more athletic. You could see the changes were evident when the players arrived for training camp today. The big difference came from Sharrif Floyd, who has completely revitalized his body during the offseason. He has eaten more fish and vegetables, while focusing on serving sizes. Floyd has cut some weight and gained more upper body strength in the process. Floyd was hard to recognize when he walked towards the dorms today. You could really see the body transformations from the offensive and defensive lineman. Phil Loadholt and John Sullivan appeared more slim and athletic and Everson Griffen added more muscle to his frame. As a whole, the entire roster appeared more athletic and physically strong in the upper body. The quarterback battle will come to fruition as training camp begins, but Mike Zimmer said Matt Cassel will be the top quarterback heading into the Vikings first practice tomorrow. "In my mind I have Cassel as the No. 1 quarterback going into camp. I don't have a starter in mind yet," Zimmer said. Zimmer stressed this didn't mean Matt Cassel would start week one, which sets the stage for a solid quarterback battle during training camp. "They [the quarterbacks] are going to determine who the starter is on the practice field about how they go about their business, how they perform in the preseason games. I understand the quarterback's a big situation," Zimmer reiterated. Tomorrow will be the first chance to see how Zimmer and offensive coordinator Norv Turner divide up the quarterback reps.
Ater Teddy Bridgewater exited his SUV and walked towards the fans, a uproar rose from a group of fans waiting for the first-round pick to arrive. The noise continued until Bridgewater stopped and signed some of his first autographs as a Minnesota Viking. The rookie quarterback saw a sea of jerseys, pictures, and young kids with footballs before his eyes. Chants rose as Teddy departed and then later returned for more autographs. Vikings fans may have to wait to see Bridgewater on the field, but they sure were excited to get their first glimpse of the rookie quarterback. Reports arose after the Starkey Hearing Gala earlier this week that Adrian Peterson was married earlier this month. The Vikings star running back confirmed these reports during his time with the media today. He married his longtime girlfriend Ashley Brown and was engaged on July 4th and later married on July 19th during a private ceremony at their home. For the first time in years, the Vikings coaching staff held a conditioning test following their arrival to training camp. The workout took place in Blakeslee Stadium and the coaches and conditioning staff ran the players through the tests in a private setting. The workouts were not open to the public or the media and the results should be released tomorrow. Players could be placed on PUP until they pass the test, or the coaching staff may release players who are not meeting the standards. As tight end Chase Ford made his way to the dorms in Mankato, his foot was wrapped with a cast and he was using crutches. Later we found out more information and learned Ford broke a bone in his foot and had surgery on July 16th. A screw was placed in his foot and the timetable for his return appears to be when the regular season begins. He wasn't sure how the injury occurred, but he was experiencing discomfort during OTA's. Mike Zimmer indicated that a player would begin the season on the PUP list and it appears Ford was who Zimmer was referencing. Vikings special teams coordinator Mike Priefer apologized today for a homophobic remark he made during the 2012 season. Priefer will be suspended for the first three games, but it could be reduced to two, if he completes sensitivity training. Priefer was very apologetic for the remarks and the attention he brought to the Vikings organization. "I'd like to start off by saying that I like to set a higher standard for myself. A higher standard of conduct, a higher standard of work ethic, a higher standard of being a father and a husband, and I expect a lot from my players, as well," Priefer said. “In this regard, in this situation, with my comment, I failed. I didn’t just go below the bar, I went way below the bar, you know,” Priefer stated. “I made a mistake. I was wrong. I brought a lot of undue attention to the Minnesota Vikings organization, I brought an unwanted distraction. And, you know, I apologize," Priefer concluded. Priefer will be coaching the team during training camp and the preseason, but his suspension will begin on the Monday before the September 7th St. Louis Rams game and will last two weeks. Matt Kalil (knee, shoulder) cleared to begin camp. The Vikings first practice session begins tomorrow with a morning walkthrough from 10:30 a.m to 11:30 a.m. The walkthrough will be followed by an afternoon practice (shells), which begins at 3:00 p.m. and lasts until 5:10 p.m.